ACRLog welcomes a guest post from Chelsea Heinbach, MLIS student at the University of Denver; Cyndi Landis, MLIS student at Emporia State University, and Alison Hicks, faculty at the University of Colorado, Boulder. How can we bridge the divide between learning about library instruction and engaging more concretely with a teaching librarian’s values and responsibilities? This was the question that drove the design of a writing assignment in our recent library instruction course at the University of Denver, and that we have been grappling with since the semester ended. Designed to mimic a core part of many academic teaching librarian positions, as well as to involve students more closely with teaching librarian communities, the assignment asked students to write a 3000 word essay that was peer-reviewed by librarians in the field, and published as an Open Access book. Drawing from the idea of publishing as pedagogy, as well as sociocultural learning theories that emphasize participation rather than imitation, students were excited to mold the assignment on the first day of class. At the same time, the prospect of writing for a broad audience at this stage of a career was very different from previous LIS program experiences. This blogpost serves to explore the experiences of two MLIS students who participated in this project, Chelsea Heinbach (University of Denver) and Cyndi Landis (Emporia State University), as well as attempting to reflect on the role and nature of instruction librarian education today. The MLIS degree is largely practical in nature. As academic librarians in training we talk about publishing as well as open access, conferences, and peer review, but there is often little room built in for identifying our own place in these processes. While there are opportunities to publish as a student, there are rarely chances in class to simulate the peer review process and to treat our work as serious academic contributions. The future regarding our own publishing remains abstract for the entirety of our master’s degree and there are few chances to explore our professional writing goals and ideas. This assignment offered us valuable mentorship in academic writing, extensive and thoughtful suggestions for improvement, as well as an opportunity to explore our professional identity in a supportive environment. As a graduate student, there is pressure to have something on your resume to make you stand out among the pool of job applicants. We each scramble to find that extra separator to distinguish ourselves from others or at least to fill in the blanks of which accomplishments we think we should have by now. This assignment was something we could be proud of and use to prove ourselves. Excitement and intimidation swept over us as we began to research and select our instruction topics. What did we want to know as a future teaching librarian? What could we research to make this open access book contribution count? This assignment was the opportunity we’d been waiting for throughout our graduate school experience – a professional introduction into scholarship that was guided and supported rather than just an assignment to be completed and tucked away in our personal portfolio. Unlike most research papers throughout our LIS programs, this assignment would be shared with professionals beyond the student-teacher relationship. Not only would library professionals assist in the peer-review process, but the open access book would later be promoted within the LIS field as an example of this unique approach. This exercise was designed to emulate what research could be like in the “real-world”. Even the peer reviewers wished they had a similar opportunity when they were in school. While we recognized this as a valuable opportunity that we were excited to engage with, we also grew nervous about the implications. With the permanence of this piece weighing heavy on each step of the writing and research process, we began to unravel the pieces of its potentially lasting effects. What topic would best fit our future career goals? Would it be something we could use to start building our curriculum vitae? Throughout the assignment, we felt the reality of this valuable opportunity sinking in, causing us to reflect hesitantly on the formation of our professional identity and our overall contributions to the field. As we received feedback from our instructor and reviewer, the constructive comments revealed areas for improvement. Our wandering thoughts now had direction and our emphatic assertions were paired within the context of practicing librarians; we had a glimpse into our book’s audience and we could refine our papers with confidence.Throughout our academic careers, we had rarely received the opportunity to improve our scholarly writing within the assignment, or even within the course. The peer-review process gave us genuine, productive feedback to revise our paper before submitting the final piece for publication. The feedback was two-fold, receiving detailed comments from Alison and our peer-reviewer. Comments ranged from pointing out areas to improve writing clarity, to making connections to concepts that we hadn’t seen before, and suggesting other sources to use for a broader perspective. As we are not yet practicing librarians, we found that some of the issues we wanted to discuss are already common knowledge in the profession. The reviewers’ comments provided the insight of instruction practitioners, helping us identify what truly needed further discussion and what research conclusions would prove helpful to our professional audience. The level of detail in the feedback given in this assignment highlighted the lack of response have routinely received throughout our academic careers. With a few exceptions, we have rarely received suggestions for improvement on our work and instead have simply received a grade. After pouring hours into research and writing, a final grade isn’t as satisfying as encouragement and thoughtful recommendations for further development. Up until this point, some of our most demanding academic work stemmed from our expectations of ourselves and our future goals. This assignment, therefore, provided a welcome break from the standard dynamic, as it gave us an opportunity to explore and assert our views in a way that felt more impactful than a simple class paper. It was encouraging to be taken seriously by a professional in the field and to have the opportunity to contribute to such a unique project. However, after the excitement of the opportunity wore off, we realized we felt nervous about moving from passively reading the literature to owning our own viewpoints. This class is a mere ten weeks long and, as students, many of us are balancing multiple jobs, volunteer positions, job applications, committee obligations, and other classes. In addition, the academic library world can feel like an overwhelmingly polarized place where work is judged and dismissed openly and critically. While these conversations lead us to important awakenings regarding issues in the profession, we found it difficult to feel comfortable as students making assertions when we were still developing our own positions. Perhaps this was simply due to overzealous imposter syndrome, but it is why some of us ultimately focused on topics that were not overwhelmingly controversial, and decided against making an obvious political statement with our work. In the end, this pressure to cultivate raw ideas and develop work that would be seen led to a more genuine interaction with the content than we have had in most other classes. Ultimately, it helped us develop our professional research goals in a more concrete and granular way, giving us a better understanding of publishing demands. At the same time, the intersection between student research and professional practice exposed some eye-opening issues that arise for LIS students. We are taught general theories of librarianship and given research assignments with little guidance of whether our conclusions and assertions are appropriate in the context of the challenges professionals face. To combat this block between the classroom and our professional careers, one of the most beneficial experiences we can have during library school is a mentor in our chosen area of librarianship. We really appreciated the feedback and we encourage librarians to seek out opportunities to mentor LIS students, to share their professional experiences, and to help to bridge the divide between theory and practice. This project enlisted an enthusiastic group of librarian reviewers, who we recognize as invisible laborers behind its success. We are grateful to them for their collaborative participation and commitment to bettering LIS student work through this publishing practice. Lastly, this memorable assignment would not have been possible without Alison’s insightful vision, reviewer matchmaking, and endless encouragement. When students and professionals engage in dialogue, it fuels our profession with a stronger foundation of new ideas and perspectives. Scaffold: The assignment built in plenty of drafting time so the peer review really helped to edit and shape the final essays. At the same time, many students found that choosing a relevant topic was tough. We suggest plenty of class discussion about potential directions, as well as interviewing a professional before starting in order to get guidance. Workshop: Our class did not build in any in-class workshopping, but that could have made the delivery of the first draft less stressful. The process of reviewing other people’s work is always helpful for writers to experience, too. Connect: This assignment was strengthened through the matching of reviewers with paper topics about which they were knowledgeable. Although the entire process was double blind,we found that this expertise, as well as the sincerity that the reviewers brought to the assignment, added considerably to the development of the second draft. The Standards for Proficiencies for Instruction Librarians and Coordinators are being revised by a Task Force appointed by the Instruction Section Executive Committee. A July 27, 2015 post on the ACRLog described the goals in revising these standards. This post shares the seven new roles that will be included in the revised standards and includes the draft section on the advocate role. From Amsberry, Dawn and Wilkinson, Carroll Wetzel. Revitalizing the ACRL Standards for Proficiency: Evolving Expertise for Instruction Librarians. Poster Session, Saturday June 27, 2015 San Francisco at the Annual Conference of the American Library Association. The revised draft Standards for Proficiencies for Instruction Librarians and Coordinators are structured in the following way. Each role includes a short description followed by a list of strengths displayed as a part of professional practice that provide evidence for that role. Advocacy can involve persuasion, activism, encouragement, and support in many forms. An instruction librarian will need to be able to contextually situate information literacy and communicate its value across a range of audiences in the university community. Advocates for professional development opportunities and other forms of career advancement. Communicates the value of information literacy to colleagues within the library system. Partners with faculty to encourage the integration of information literacy within courses and within curricula. Engages with other campus entities to integrate information literacy into co-curricular activities. Promotes and advances information literacy framework to library leaders and campus administrators. Advocate for information literacy in relationship to student success in the context of institutional learning goals or outcomes. The Task Force is currently completing the full draft of the roles and will share the draft document beginning in January 2016. Please contact co-chairs Sara Harrington (harrings@ohio.edu) and Carroll Wetzel Wilkinson (cwilkins@wvu.edu) with questions, comments, and feedback. Your thoughts and feedback are invited! The Instruction Section has charged a Task Force to Revise the 2007 document “Standards for Proficiencies for Instruction Librarians and Coordinators” as part of the Section’s cyclical review of standards. Over the coming months, the Task Force will be sharing information about the draft revisions to the Standards via the ILI-L listserv and this blog. We invite your comments, questions and suggestions at via email to Co-Chairs Sara Harrington (harrings@ohio.edu) and Carroll Wetzel Wilkinson (cwilkins@wvu.edu) or in response to this post. ACRLog welcomes a guest post from Nicole Pagowsky, Research & Learning Librarian and Instruction Coordinator at the University of Arizona Libraries. You can find her on Twitter at @pumpedlibrarian. When I first thought about writing this post, I considered how boring it would sound to read an article about a library’s instructional philosophy. Who is going to be racing to read that? I mean doesn’t it kind of seem like recycling in a way? We all know we should be doing it but it’s not necessarily exciting, and do we know for sure if those supposed recyclables aren’t actually just getting mixed in with the trash and dumped in a landfill? Analogies aside, having an instructional philosophy for our library is essential and I want to talk about why that is and then share what we developed. With a library re-organization comes new roles, along with the continually changing roles of librarianship as a field. The University of Arizona Libraries have undergone a re-organization over the past year from functional teams to a liaison model (I was an Instructional Services Librarian, now a Research & Learning Librarian). To facilitate a cohesive instruction program that would align all liaisons, library faculty created an instructional philosophy that positions shared pedagogy as inherent in our new work. This is an important first step in establishing an instruction program: what can we all agree on, and what can we all reference, as we build our teaching roles as liaisons? We should also be thinking about how faculty view us: what they expect of us and what they don’t (and why). Having a shared instructional philosophy can be one way to signify that we truly are educators and partners. Clearly, one document will not solve everything, but it is one step toward aligning our roles, improving our teaching, and changing faculty expectations. We felt that developing a shared instructional philosophy was important to revamp and revise how we envision ourselves as educators, and how we can communicate this to campus. 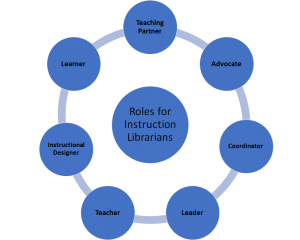 Although we all have different liaison assignments and focus areas, how can we approach a library instruction program collectively? With varying disciplinary needs for instruction the details of our approaches might be different. However, we’re aligned through bigger-picture goals, expressed in our pedagogy. By connecting this pedagogy with activities such as curriculum mapping, we can then enable a point-of-need program to reach students across campus with scaffolding and differentiated instruction through collaborations with faculty as we continue to move away from the one-shot. With library practice and instructional technologies often in flux (because that’s just the nature of things), a philosophy with an evidence-based link to theory and reflection can help ground us even if our practice changes. By actively linking theory to practice, we are then engaging in praxis. Praxis, as Freire and hooks have described it, is theory into practice–action!–through reflection. Action embodies our values. And theory makes it possible to question and examine what values we hope to put into action. So we don’t want to divorce theory from practice, nor do we want to emphasize the importance of one over the other. Our instructional philosophy doesn’t view theory and practice as mutually exclusive but wraps them up together into praxis to guide our work as educators. Often, disciplinary faculty don’t think of librarians as necessarily interested or capable instruction collaborators. These expectations carry weight, primarily because how we’re perceived influences what’s expected of us. We need to transform these inaccurate impressions of us as teaching partners. In the educational psychology literature, this is referred to as “expectation effects” and is linked to “impression management.” This has been studied extensively when looking at the impact of teacher/student expectations on student success. If faculty have incorrect or uninformed expectations of us through the lens of this power structure, it will color perceptions and maintain our assumed role as just “helper,” subsequently maintaining how we are able to approach teaching. This is part of what gets us relegated to the one-shot. If faculty won’t interact with us fully to understand what we do and our capabilities as educators, their expectations will remain the same, and our relationships–and teaching approaches–won’t change. Of course programmatic instruction and collaboration with faculty take work and require relationship-building, which is not instantaneous. Being able to navigate these power structures while understanding how they hinder us should be considered a piece of the puzzle. By having a library instruction philosophy document that liaisons can share, we can explicitly show what we’re capable of doing, as a way for faculty to better understand our roles as educators. The process for this document went through several iterations. We had a good amount of debate back-and-forth on content and wording, because we certainly didn’t all agree on everything off the bat. I began the document and wrote out what I felt could be some main points of focus to guide our instruction. These were either things we already have been doing, or things that I thought we could be doing. Of course having one person begin a document makes it skew more in one direction, but it was an approach that helped get the process going. The hope was to develop something that was not quite a manifesto, but to collaboratively create something that would guide and inspire. The document was then shared with our instruction group (within our department) for discussion and revision. Then, we shared it with our whole department and again had some discussion and revision. We all compromised to create a truly shared philosophy. Some of us feel more strongly about certain points than others, but this is something we can use to situate and clarify our abilities as educators to campus. After we accepted it for our purposes, we thought it would be useful to share it with other departments in the library who do instruction (Special Collections and the Arizona Health Sciences Library liaisons). These two groups felt the document represented their interests, and at this point we’re using it to serve as a focal point for driving our new instruction program forward, and an official piece in our constellation of guiding liaison documents for the UA Libraries. Although a philosophy is meant to be longer-lasting, this document is also fluid in that we are open to change as we continue to learn and progress in our instructional program. Ahmed, S. (2012). On being included: Racism and diversity in institutional life. Durham [NC]: Duke University Press. Cahoy, E. S., & Schroeder, R. (2012). Embedding affective learning outcomes in library instruction. Communications in Information Literacy, 6(1), 73. Detmering, R. & Johnson, A. M. (2012). “Research papers have always seemed very daunting”: Information literacy narratives and the student research experience. portal: Libraries and the Academy, 12(1), 5-22. Egea, O.M. (2014). Neoliberalism, education and the integration of ICT in schools. A critical reading. Technology, Pedagogy and Education, 23(2), 267-283. Ward, D. (2006). Revisioning information literacy for lifelong meaning. The Journal of Academic Librarianship, 32(4), 396-402.